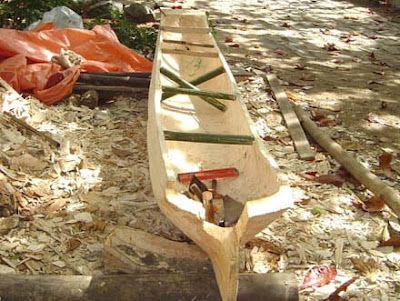 It will come as no surprise that the traditional Brazilian dugout is fading in popularity – like most indigenous boats (indeed, like much indigenous culture) around the world. 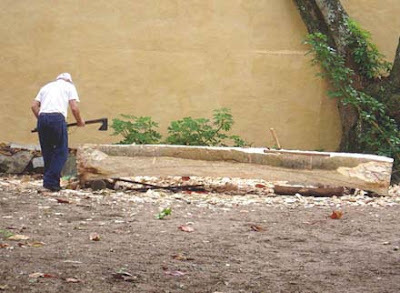 According to materials provided by my source, Silvio Antunha, forest protection laws enacted in the 1970s have made it difficult to obtain trees suitable for the construction of traditional dugouts in Brazil, and the knowledge and skills are on the wane as older builders leave the scene without an opportunity to pass that knowledge on to a new generation. 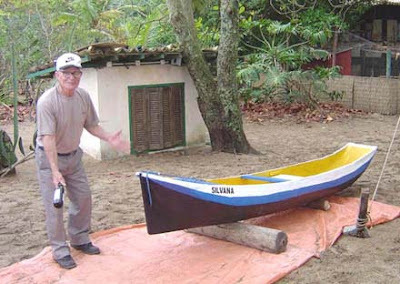 The boats are sometimes called vogue canoes (or bogue in Caiçara pronunciation), vogue being the term for paddling, the stroke or rhythm of paddling, or the paddler who calls the stroke. 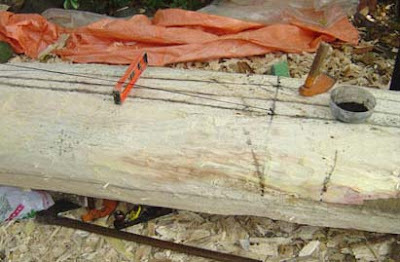 Smaller caiçara canoes, like those shown in my previous post, are usually built from softwoods like guaperuvu (Schizolodium parahybum), while larger ones – up to 40 feet long! 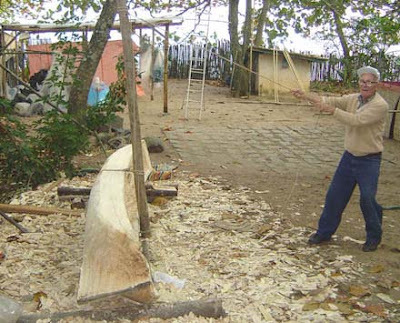 – make use of more rot-resistant woods like jequitibá , and oars (paddles?) and other components are made of jacatirão (Tibouchina pulchra), massaranduba (Mimusops brasiliensis) and caixeta (Tabebuia cassinoides). The rowing canoes of this size are propelled by a team of several paddlers, using even sailing gears, when it has a mast fixed on the front of the vessel. 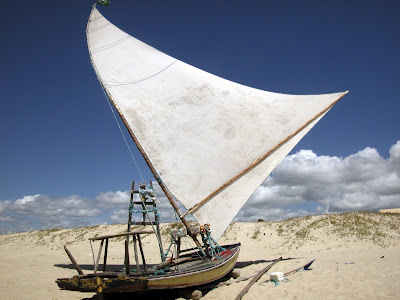 As the vogue canoe has no keel, the sails (which could reach the number three) are used only with winds from the stern of the vessel. rum) of the northern coast was shipped by this type of vessel. From the 1920s, the vogue canoes began to be moved by motors. It's interesting that these boats, which are reportedly very unstable, were used for coastal freight carrying, and under sail. The strikingly colorful paint schemes, as shown above and in the previous post, seem to be characteristic of the craft. For more nice photos like the one above, and text in Portuguese, see this page from the Oceanographic Institute of the University of São Paulo. 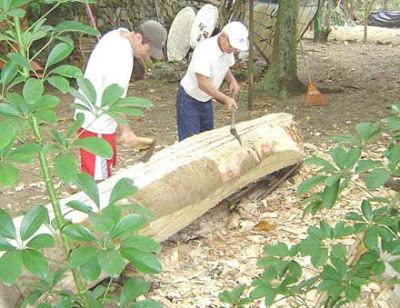 Correction to previous post: The phrase “to pull,” meaning to build a canoe (by “pulling it” out of the tree trunk) comes from a Caiçara term, not Portuguese. 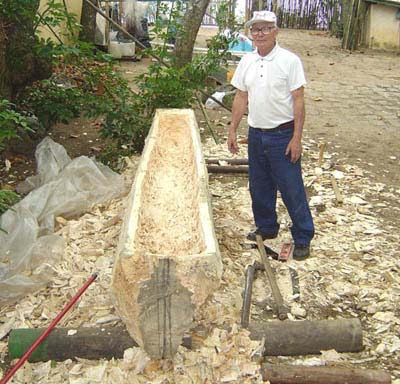 I received much great information on Brazilian dugouts from reader Silvio Antunha. I hope to cover this over several posts, but we’ll start with these great photos of the construction process. 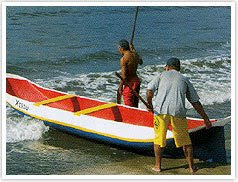 The boat shown is a "canoinha" , or little canoe, built in the style of Caiçara, in the southernmost state on the Brazilian coast. 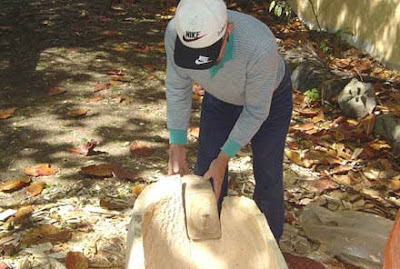 Interestingly, the process of dugout building is known by the Portuguese term for “pulling,” – not in the sense of a Western “pulling boat,” but according to the idea that the boat is “pulled” out of the tree. 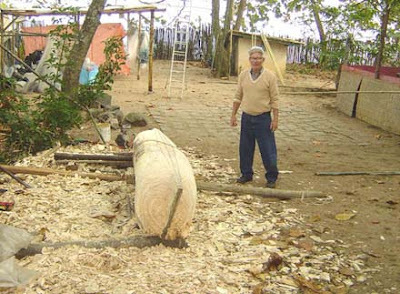 The finished boat, named Silvana, is shown at the top of the post, with the builder, Sr Israel . More to come on these beautiful boats in a future post. Many thanks to Silvio for this great input. It's not often that something remotely related to indigenous boats appears on CNN. But combine a ton of money, a good publicist, and a topic that's suitably wacky, and it shouldn't be surprising. The deal is: a young Mr. DeRothschild, of banking family fame, is building and plans to sail a catamaran made from recycled pop bottles from California to Australia. Lovely. I do have to give him credit for a clever name for the boat, however: Kon Tiki, meet Plastiki. American marine artist John Prentiss Benson (1865-1947), younger brother of the renowned American Impressionist painter Frank Benson, was born in Salem, Massachusetts, lived later in Kittery, Maine, and perhaps naturally spent most of his creative efforts documenting the boats and ships of his home waters and, by extension, the western tradition. 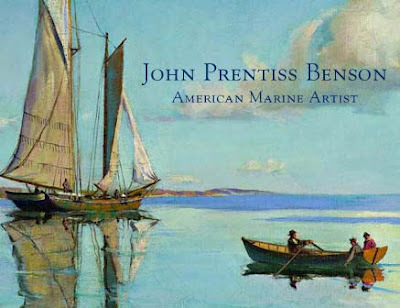 A lovely new book from Baker Marine Publications, John Prentiss Benson: American Marine Artist, includes more than one hundred color plates of the artist's work, and I recommend a look to anyone with a general interest in marine art in general, or the western boat/ship tradition. For our purposes, the book includes just one painting of an "indigenous" boat, which I'm reproducing here with permission of co-author and Benson descendant Nick Baker. 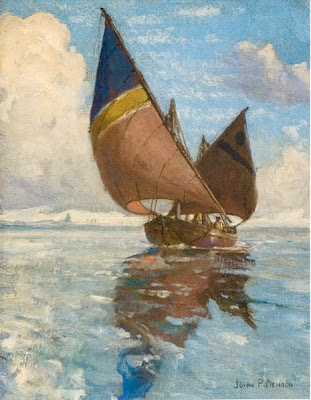 Although the non-western subject matter isn't typical Benson, the style is very much so: beautifully rendered water and sky in a somewhat Impressionistic style, combined with convincingly rendered boats in a superbly well-balanced composition. I expect this book will introduce the not-so-very-well-known artist to a larger audience. He deserves it. For more on the artist and his work, see the authors' website. 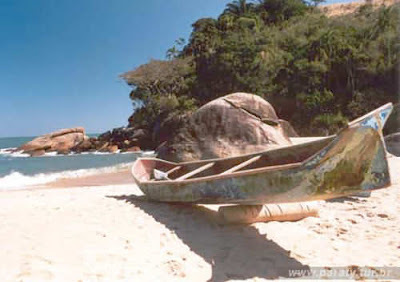 Regarding the enormous size of dugout canoes observed by early European explorers to Brazil, take a look at Paul Lima's comment at the bottom of this post. Also see his website, The Endangered Coast. 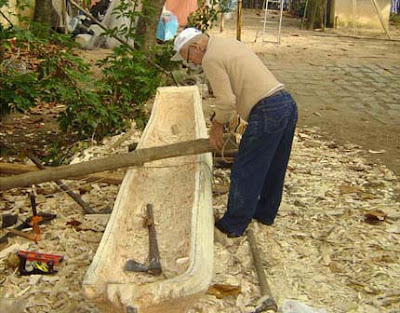 A link to material on contemporary Brazilian dugouts was provided by reader Silvio Titanic Neruda , which can be found attached to my very first blog post, here. I was unable to open the link in the comment, but Silvio has provided me with some of the materials (and kindly translated some of the content from Portuguese), and I'll be posting this great input soon. Many thanks to both contributors! 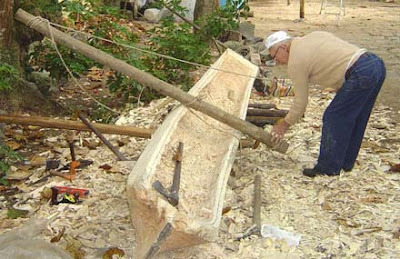 Readers, please feel free to get in touch with all kinds of content related to boats from outside the Western plank-on-frame tradition -- I'm only too glad to put it in front of other readers. That includes just about anything on traditional boat types from Asia, Africa, and Latin America, plus canoes, kayaks, and rafts from anywhere.